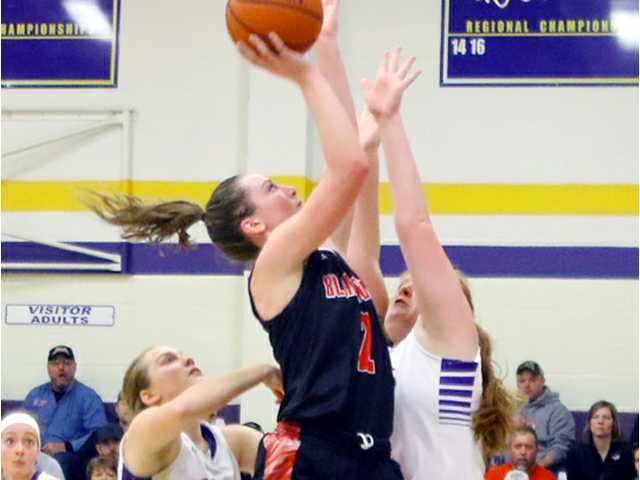 POSTED February 14, 2019 11:36 a.m.
BARNEVELD — There was a lot for Black Hawk to celebrate in Barneveld on Saturday as junior Hannah Butler joined the Black Hawk girls’ basketball 1,000-point club on the same night the Lady Warriors clinched sole possession of their third consecutive Six Rivers East champion crown. The top-ranked Lady Warriors (20-0 overall, 11-0 SRE) opened the game with 17 unanswered points to take control early and then poured in the first 14 points of the second half to pull away from the host Golden Eagles (4-13, 4-5) en route to a 46-16 title-clinching victory at BHS on Saturday, Feb. 9. Hannah Butler needed just seven coming into the game to reach the 1,000-point mark for her career; and, after Warrior teammate Natalie Leuzinger scored her 1,000-point against Barneveld earlier in the season, the Eagles seemed determined not to let H. Butler do the same against them on their home court. But, they could not hold her down the whole game. “We weren’t surprised by that. I credit Barneveld with their defensive effort. They played really hard. They were determined not to let (Hannah) get it and that motivated them collectively to play incredibly hard,” explained Flanagan. Bailey Butler put the Warriors ahead to stay with an early basket and H. Butler followed with a basket of her own to up the lead to 4-0. It would be her lone basket of the first half. Leuzinger scored seven points, B. Butler added three more and Kaylee Marty added a 3-pointer to put Black Hawk up 17-0 with 6:50 remaining in the half. Barneveld’s Leah Marx hit two free throws at the 5:39 mark to put the hosts on the scoreboard, and Kyla Ihm buried a 3 at the 3:10 mark for the Eagles’ first field goal of the game. Black Hawk ended the half on a 5-0 run to take a 23-5 lead into the locker room at the intermission. Bailey Butler scored the first nine points of the second half and Macie Stauffacher hit a trey to extend the Warriors’ advantage out to 30 points, then H. Butler took over and scored three straight baskets for the guests to make it 41-10 while topping the 1,000-point plateau for her career with 7:56 remaining in game. She is the sixth player in program history and the 11th basketball player in school history to top the 1,000-point mark for a career, and she also becomes the third member of her family to achieve that milestone joining older sister, Paige (1,094), and older brother, Heath (1,367), in the Black Hawk 1,000-Point Club. Hannah Butler finished the night with 1,002 career points after netting nine points on the night. She also led the team with 13 rebounds, seven steals and three assists. “She’s just so humbled and she doesn’t want the spotlight on her. That’s the type of player you’re really proud of when the achieve something like this. She comes to practice every day and does her job. She has that blue-collar attitude,” Flanagan commented about H. Butler. The Warriors coasted from there to remain unbeaten on the season with a 46-16 win– their sixth straight over Barneveld. Bailey Butler matched the Eagles in scoring with a game-high 16 points and she added seven steals in the win. Leuzinger registered a double-double with 11 points and 10 rebounds to go along with three blocked shots for the Warriors. Marx and Libby Oimoen scored four points each to lead the Eagles. The Lady Warriors opened the week by stampeding the host Monticello Ponies, 70-23, in a SRE affair played at MHS on Tuesday, Feb. 5. Black Hawk led 39-10 at the half, and then went on to outscore the Ponies (9-8, 4-5) in the second half by a 31-13 margin. Leuzinger outscored Monticello all by her self with a game-high 26 points. H. Butler chipped in with 20 points and led the team with eight rebounds and five steals, while B. Butler scored nine points and Marty added seven with each player dishing out four assists on the night. Abby Wicker led the Ponies with 10 points. Black Hawk’s non-conference game at Darlington was cancelled so the Redbirds could reschedule a conference game. The Warriors can complete a third consecutive undefeated regular season when they host Albany (14-5, 6-3) on Friday, Feb. 15, in the SRE finale. Black Hawk received the #1-seed in their regional bracket. They will begin the WIAA Division 5 tournament by hosting#16-seed North Crawford (0-17) in a regional quarterfinal game on Tuesday, Feb. 19, starting at 7 p.m.
Black Hawk – Bailey Butler 9, Hannah Butler 20, Natalie Leuzinger 26, Kaylee Marty 7, Macie Stauffacher 2, Maddy Huschitt 2, Sydney Delzer 4. Totals – 28 7-8 70. Monticello – Noriega 7, Wicker 10, Errthum 2, Klossner 4. Totals – 11 1-4 23. 3-point goals– BH 7 (B. Butler 3, Leuzinger 3, Marty 1), M 0. Total fouls– BH 7, M 12. Fouled out– none. Black Hawk – Bailey Butler 16, Hannah Butler 9, Natalie Leuzinger 11, Kaylee Marty 4, Macie Stauffacher 3, Maddy Huschitt 2, Sydney Delzer 1. Totals – 18 6-12 45. Barneveld – Gordon 3, Ihn 3, Leister 2, Marx 4, Oimoen 4. Totals – 5 5-8 16. 3-point goals– BH 4 (B. Butler 1, Leuzinger 1, Marty 1, Stauffacher 1), BA 1 (Ihn 1). Total fouls– BH 15, BA 12. Fouled out– none.